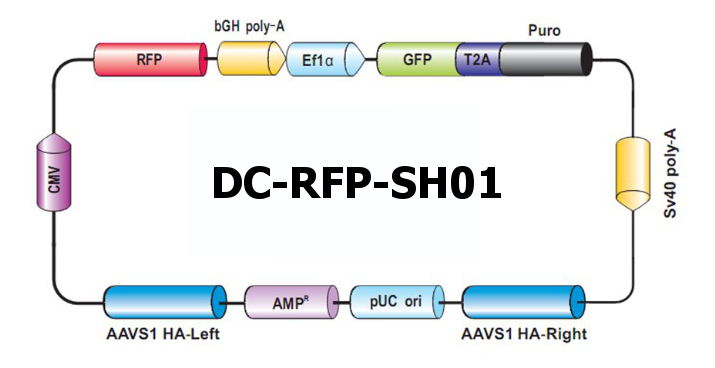 Human AAVS1 and mouse ROSA26 safe harbor knock-in kits – CRISPR- or TALEN-mediated gene targeting kits designed to specifically transfer your gene of interest, selection marker or other genetic element into the human AAVS1 or mouse safe harbor sites. 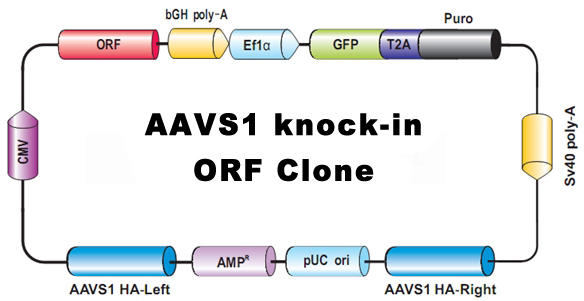 More than 35,000 AAVS1- and ROSA26-compatible ORF donor clones are also available. The safe integration ensures transcription-competency of the transgenes and presents no known adverse effects on fitness. To display your kits of interest, select species, genome editing technology, and donor options from the table below. Note: If you do not see Safe Harbor knockin kits with the donor clone you need, you can take advantage of our Custom Safe Harbor Donor Cloning Services. We will construct knockin donor clones containing genetic elements of your choice for targeted Human AAVS1 and Mouse ROSA26 Safe Harbor integration. To get a quote, please click here. Visit the Safe Harbor knock-in kits page for more information. 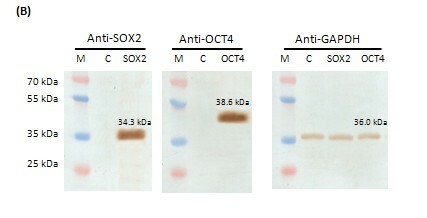 Figure 3: Human genome safe harbor AAVS1 gene targeting of OCT4 and SOX2. 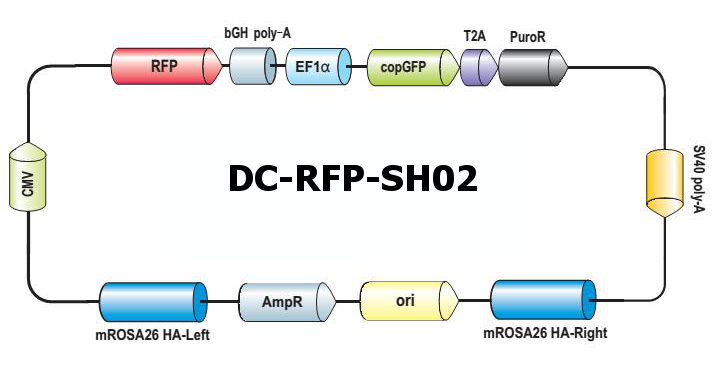 (A) OCT4 (Cat#: DC-Z0092-SH01) or SOX2 (Cat#: DC-T2547-SH01) donor plasmids were co-transfected with an AAVS1 TALEN pair into HEK293T cells in a 6-well pate. 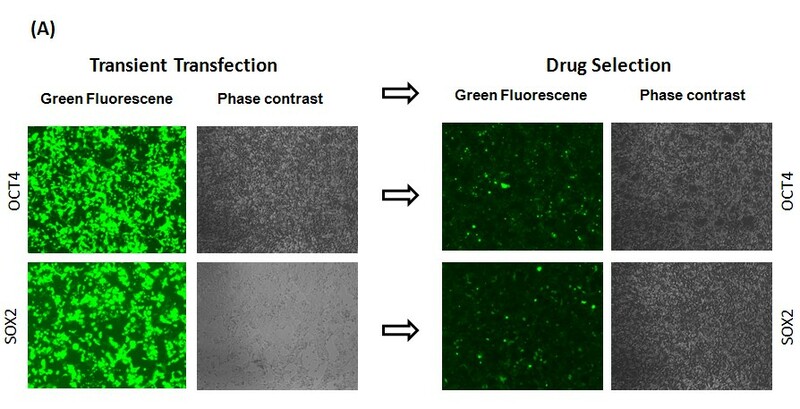 Cells were sub-cultured 48 hr post-transefection and selected against puromycin (1 µg/ml) for 2 weeks. 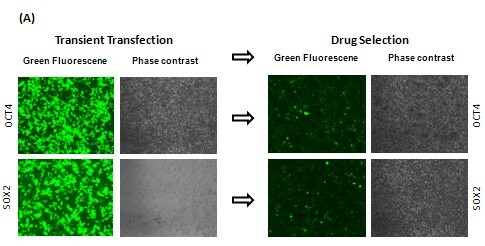 The expression of copGFP was checked under a microscope (Nikon Eclipse Ti ) 48h post-transfection or after 2 weeks of drug selection. Few colonies remain from cells transfected with donor plasmid alone after puromycin selection (data not shown). (B) Western blot analysis of proteins from HEK293T cells stably integrated with SOX2 (Cat#: DC-T2547-SH01) or OCT4 (Cat#: DC-Z0092-SH01) at the AAVS1 site, with cells alone as negative control. 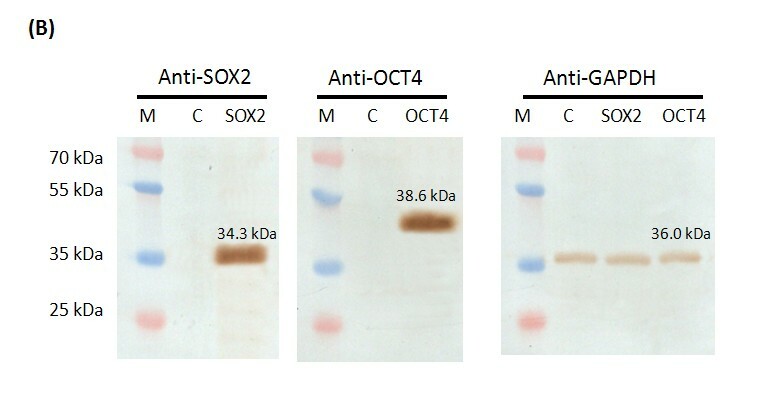 Endogenous Sox2 and OCT4 protein levels were too low to be detected in the same blot. 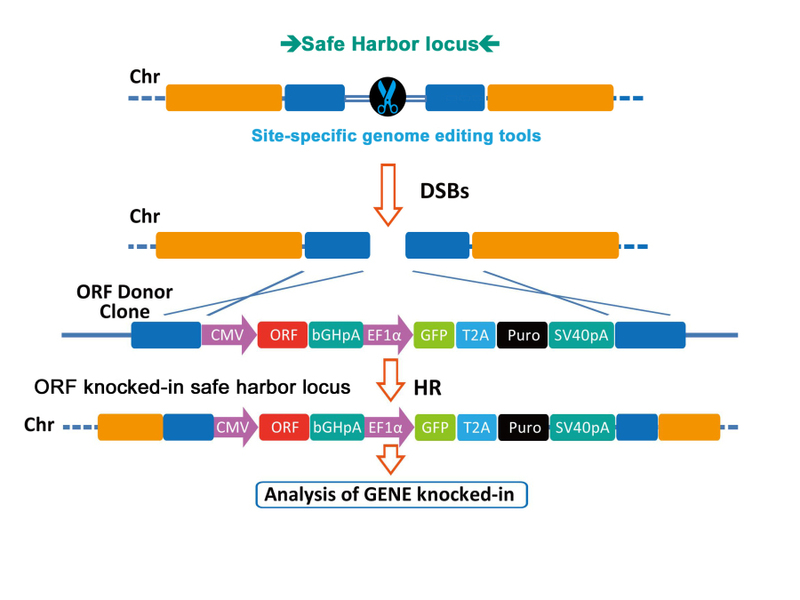 GeneHero™ CRISPR-Cas9 stable cell lines – Pre-made human cell lines H1299, HEK293T, HeLa, and A549 with the CRISPR Cas9 nuclease stably integrated into the human AAVS1 “Safe Harbor” site. GeneHero™ CRISPR-Cas9 products and services – GeneCopoeia offers CRISPR-Cas9 sgRNA design and cloning services, Cas9 expression clones and other related products and services for simple and fast targeted genomic editing. Genome-TALER™ TALEN and TALE-TF custom services – GeneCopoeia offers several levels of affordable custom services for designing, creating and validating TALENs, TALE-TFs and other TAL effectors-based targeted genomic modification tools. This entry was posted in Products and tagged Knock-in ORF clones. Bookmark the permalink.